I'm sure that by now your research has revealed that outdoor refrigerators tend to be expensive. Most of those low-end results are not outdoor-rated refrigerators nor are they designed for outdoor use. The highest-end results are often commercial-rated, and not really favorable for home use. I'd like to focus on a few of those models in this article. 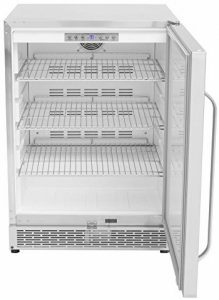 *NOTE: Yes, you CAN get cheap outdoor refrigerators under $500, but you will sacrifice one or more of those ideal features I mention below, and may have to take extra care to maintain them. 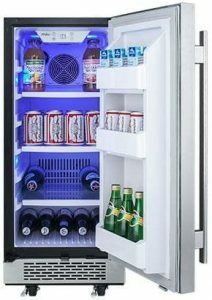 In keeping with this website's theme of listing “3 Good Ones”, I thought that, instead of just listing 3 good outdoor refrigerators under $1,000 for this article, I would list 3 Categories of outdoor refrigeration units that won't cost you more than $1,000. This way, you'll have three solid strategies for conducting your own search. For each category, I'll explain the concessions or compromises the manufacturers made to reduce the cost of the units, the conditions in which they work best, and why you might want to go with one of these refrigerators to save your money. Then, I'll list a few good options you might consider purchasing. But first, let me talk a little bit about what makes for a good outdoor refrigerator. Then, I'll give you my suggestions for good ones under $1,000. As I've reviewed in a previous article, there are a few reasons why outdoor refrigerators are more expensive than their indoor counterparts, and why you might not want to use an indoor refrigerator in an outdoor setting — aside from simply voiding the warranty. It's hot out there. It's humid. The temperature can swing from blazing hot in the day, to extremely cool at night. And, it could potentially be rainy, or wet for other reasons. Rust Resistance — High-quality stainless steel is used to resist rust in wet weather and humid environments. Extra Insulation — It can get much hotter outdoors than indoors, so heavy-duty insulation helps to keep everything cool. Advanced Compressors & Components — The electrical and mechanical parts of the fridge are designed to work extra hard in the heat. Good insulation isn't enough to keep its contents cool during hot weather and drastic temperature fluctuations. UV Protection — The harmful rays of the sun may be beating down on, or reflected onto parts of your fridge. This will not only create extra heat, but can damage coloring or plastic surfaces. Make sure it can handle sunlight, or keep it covered. Ventilation — Building your fridge into an outdoor kitchen island or other fixture means it will need additional vents on the front to allow it to release heat and function properly. Otherwise, you will need to install it with extra space around it for ventilation. As you can tell, there's a bit of extra engineering that goes into keeping your food and drinks cold in the outdoor summer heat, and into protecting your investment. However, it doesn't mean you have to be more than $1,000 in the hole. If you're willing to give up just a few bells & whistles, it's still possible to find good outdoor refrigerators that abide by these basic requirements, and at an affordable price. There are several things you can do to maintain your fridge for a longer life. Even though these appliances are specially engineered to hold up in outdoor conditions, you can still extend the lifespan and optimize your outdoor refrigerator with a little extra attention and care. Just because it's an “outdoor” refrigerator doesn't mean it's “all-weather” — that it can withstand rain, snow, and hurricanes.Keep it covered from the rain, and away from the pool, sink, and other sources of water. If it's not built-in to your outdoor kitchen island, bring it inside when it's wet outside. This is especially important if the electrical components are not properly weatherproofed and UL rated for outdoor use. We all know that sunlight will heat things up. But, we assume that because the sun is not shining on the inside of our refrigerator, the contents are safe from the extra heat.Refrigerators work by pulling heat from inside, and releasing it into the air outside. If it's too hot on the outside, the heat won't be released properly. Also, heat gets transferred through the metal and other parts of the fridge. If the insulation is not thick enough, it will let some of the heat inside to your food and drinks. You can build it into (or store it under) a cabinet or kitchen island that will keep it out of the sunlight. Or, you can keep your fridge covered and in the shade. As I just mentioned, refrigerators need to release the heat from the inside into the air around it. If there is no air around it, or if the air isn't properly refreshed, then the heat can't escape, and the contents don't get cold.The so-called “built-in” refrigerators have a vent on the front to make sure hot air can get out of the fridge even if you install it snugly into an outdoor kitchen island, or a cabinet of some kind. 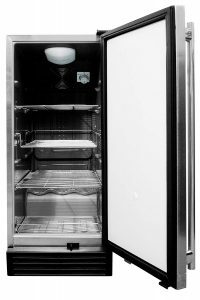 “Freestanding” refrigerators do not have an vent on the front, and need to have the top, back, and sides exposed to some air in order to release the heat. All this information about how to make the most of your fridge is written out for you in your refrigerator's installation manual or owner's guide — but most people simply don't read this stuff.This is where you'll see what kinds of environments and temperatures the refrigerator will work in properly, and what kinds of protection you'll need to provide for. 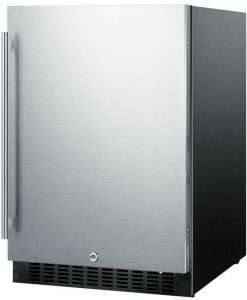 That's why I've included links to the manuals here in all my outdoor refrigerator reviews on 3GoodOnes.com. These manuals are almost always available online. You should read them carefully to be sure the fridge is a good fit for your space and your entertainment needs — before you make your purchase! 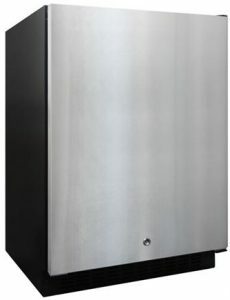 Beverage Coolers (sometimes called “beverage centers” or “wine coolers”) are are a popular and affordable outdoor refrigeration appliance. They keep your drinks cold and at the ready for all kinds of outdoor entertainment activities. However, they are not quite “refrigerators”. I wanted to go over this category first, because these units are actually a slightly different beast than outdoor refrigerators, and knowing the difference between being a satisfied customer and wasting your money. 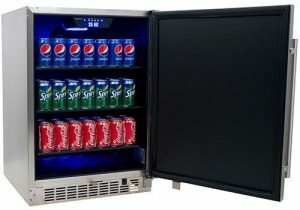 The distinction between these two types of refrigerators can be confusing, and many people have been disappointed by accidentally buying an outdoor beverage cooler when what they really needed was an outdoor refrigerator. They wouldn't have been if they'd only known the subtle difference: Temperature. By contrast, Beverage coolers are designed to simply keep a variety of drinks cold. These beverages are usually in containers, so there's no real concern for bacteria. Additionally, some beverages (such as red wine) shouldn't be kept too cold. For these reasons, beverage coolers are designed keep the contents temperatures ranging between 38°F and 65°F. I'm sure you can see the potential conflict of interests here. Even at its coldest, a beverage cooler will have some trouble preserving certain types of food in a hot outdoor environment. This is why you'll see a number of unfair negative beverage cooler reviews online complaining about “spoiled food”. So, the trade-off with beverage coolers is that, while they can operate outdoors in the heat, they can only keep their contents in a limited temperature range. 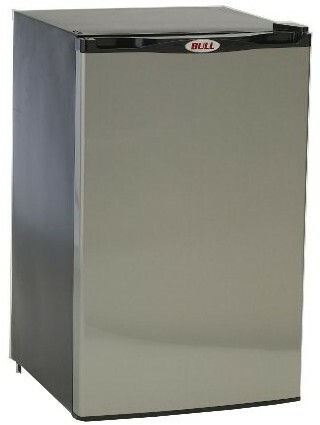 EdgStar's CBR1501 Outdoor Beverage Cooler is a very popular outdoor refrigeration solution online. This cooler's 5.5 cu. ft. capacity can hold up to 142 twelve ounce cans on its 3 adjustable glass shelves. 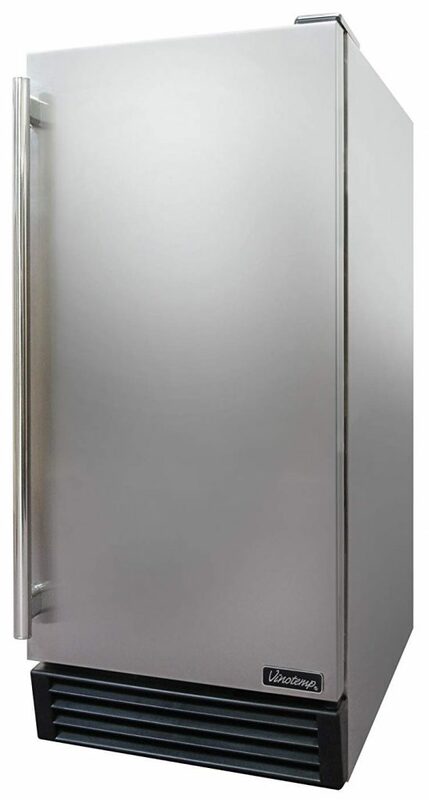 The “outdoor approved” fridge is fully encased in stainless steel, including a Solid Stainless Steel Door, allowing this refrigerator to handle the elements in outdoor applications, whether built-in to a cabinet, or freestanding. 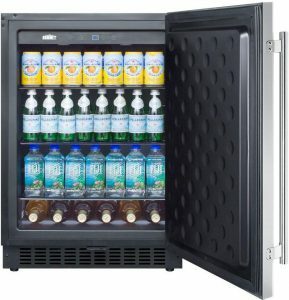 Its digitally controlled fan-circulated cooling system maintains an evenly distributed interior temperature range of 38°-50°F*, keeping your drinks cool in outdoor temperatures ranging from 50°F to as hot as 95°F. One unique selling point for an outdoor refrigerator in this price range is the cool-blue lighting of the interior. Not only does it give the impression of being colder inside, but looks very impressive to guests, and sets a nice mood and ambiance. This unit may be outfitted with casters for greater ease of movement, has a built-in lock for security, and comes with a 1-year manufacturer's warranty for labor & parts. 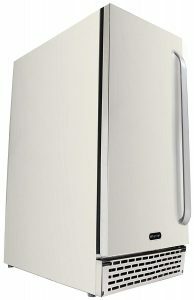 While Whynter's BOR-53024-SSW is marketed as a “beverage refrigerator/cooler”, this 5.3 cu.ft. 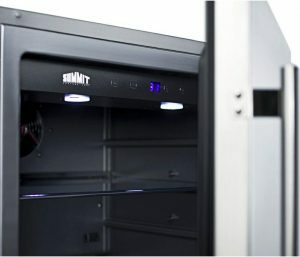 unit can actually cool its contents down to as low as 32°F (and up to 64°F), making it ideal to store food at the lowest temperatures, and even red wine at the higher temps. The trade-off here, however, is a limited outdoor temperature range: between 60°F (16°C) and 90°F (32°C). The full stainless steel body and front ventilation allows it to work freestanding or built in to an outdoor kitchen fixture, and digital controls and temperature indicators adapt to Fahrenheit or Celsius degrees. Check out the manual for details about it's “fast cool mode”, which will prepare the fridge for cooling drinks and food as quickly as possible. The unit features reversible door hinges for adaptable installations, safety locks, and included optional casters for mobility/portability. 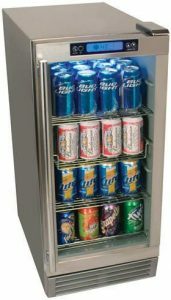 3 adjustable and removable shelves accommodate beverage cans, bottles or foodstuff. The Whynter BOR-53024-SSW comes with a one year limited warranty. Also look at Whynter's narrower 15″ option (Whynter BOR326FS) here at Home Depot, Appliances Connection, and on Amazon. If you're willing to save a little extra space, another way to save on cost is to buy a slightly smaller unit. You get all the benefits of a full-fledged outdoor refrigerator, only with a little less storage space, which isn't a problem for many outdoor kitchens. I'm calling this smaller, standardized size for outdoor refrigerators “sub-compact” because the standard-sized outdoor refrigerator is already pretty compact. While the standard “full-size” outdoor refrigerator is about 24 inches wide, there is another smaller size that is still a standard for outdoor and under-counter refrigerators: 15 inches, with about 3 cubic feet of storage space. 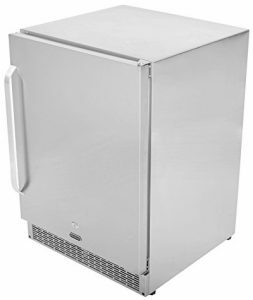 Maxximum Food Service, maker of the Maxx Ice and Maxx Cold brands, is known for making a variety of refrigeration appliances for both home and commercial use. The Maxx Ice MCR3U-O (The “O” for “outdoor” so as not to be confused with the indoor model) is a 15″ wide, all stainless steel construction, with a 3 cu. ft. capacity. It's ETF rated to operate outdoors in temperatures ranging from 25°F to 100°F, keeping drinks and food at selected temperature range from 35°F to 50°F. The reversible door allows for an adaptive installation, which can be either freestanding or built-in, thanks to the front ventilation. Other features include 3 adjustable (removable & reversible) shelves, a wire basket to hold cans and bottles, a digital thermostat, and interior light. As their name suggests, Vinotemp is known for wine-related refrigeration appliances and accessories. 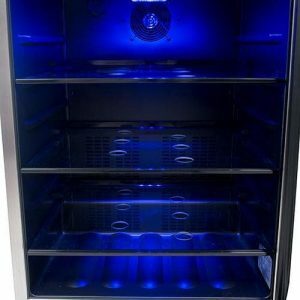 They make a wide variety of both commercial and residential wine coolers, wine cellars, beverage dispensers, and refrigerators. This 3.18 cu. ft. outdoor refrigerator has a stainless steel door and cabinet body, a full-length door handle, three wire shelves, and a wire basket. Shelves slide out for easy access to contents, and are reversible and removable, to allow for keeping wine bottles stable and to maximize your storage space. A front exhaust vent allows for built-in installation as well as freestanding, and of course an overhead internal light will make it easy to find what you're looking for. Avallon is an appliance development venture of EdgeStar that provides wine coolers, beverage coolers, and outdoor refrigerators. They say their mission is to offer these at more affordable prices by minimizing excess features, but their products are pretty full-featured by most standards. 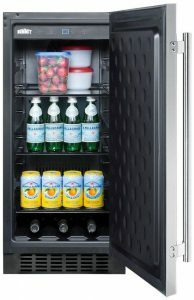 This unit takes advantage of its superior 3.3 Cu Ft storage capacity with three sanded-glass shelves and even door storage for large beverage bottles, milk, orange juice, or the like. LED lights illuminate the interior, with the option of using white or blue lighting for setting mood (like its Edgestar cousin I mentioned above). Fully encased in stainless steel, the AFR151SSOD is designed to withstand outdoor elements, utilizing circulation fans that work with the compressor to provide even cooling throughout the unit — keeping your contents at a temperature range from 34°F to 50°F, based on your selection from the touch-control panel. It also includes a carbon filter that blocks unwanted odors. 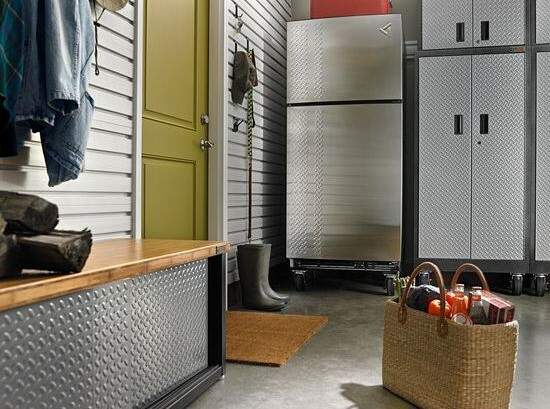 With optional casters for mobility, a lock for security, and a front vent allowing for built-in installation, the matching stainless steel door and solid handlebar are the finishing touches on this professional-looking fridge. The AFR151SSOD comes with a one-year warranty on defective parts and labor, and a 5-year limited warranty on the compressor. 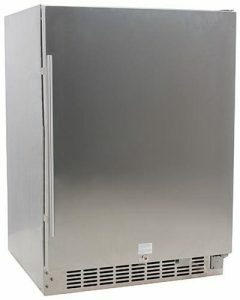 Summit Appliance supplies refrigerators, freezers, and cooking appliances for commercial, professional, foodservice, medical, and specialty applications, particularly catering to small or unusual spaces. For that reason, you'll find their sales materials a little overly technical. But, don't let that deter you. 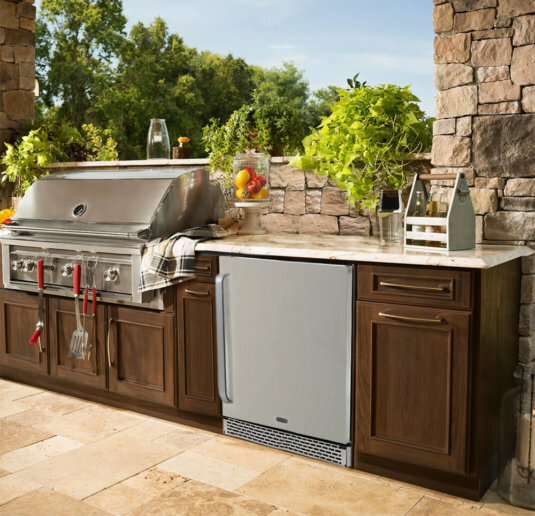 This fridge is still a great option for an outdoor kitchen at your home. 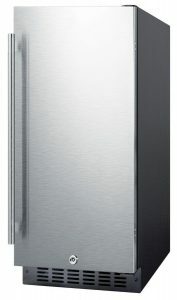 Summit's SPR316OS outdoor all-refrigerator designed for use in residential or commercial outdoor kitchens. On the outside, its weatherproof construction allows operation in the outdoors — while the vent allows for built-in to an outdoor kitchen fixture, its fully-finished cabinet also allows freestanding use in ambient outdoor temperatures from 44°F to 90°F. 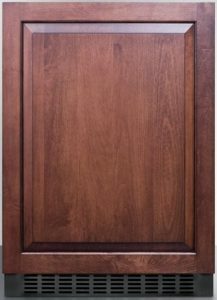 The reversible stainless steel door sports a 20″ long handle for a professional look, and a factory-installed lock for security. Inside, the SPR316OS provides 3 cu.ft. of storage space, with adjustable glass shelves, and slots on the floor sized to hold wine bottles in place. Digital thermostat controls combined with fan-forced cooling keep the contents evenly cooled at an ideal range of 36°F to 43°F. Recessed LED lighting makes it easy to find what you're looking for. Other added features include door-ajar and temperature alarms to prevent spoiling of food, a quick-freeze function to get things cold fast, and a Sabbath-mode setting to temporarily disable the lighting and alarm. There is a one-year warranty on defective parts and labor, and a 5-year limited warranty on the compressor. Some of you may be happy with the most basic functionality of outdoor kitchen refrigerators: keep your food and drinks cold and handy while you're out on your patio. You don't need glass doors to display the contents without opening, nor special lighting, nor stainless steel interiors. As long as it does the basic job with a little adaptability to your storage needs, you're set. At the lower end of many manufacturers' outdoor refrigerator lines is a basic model that will fit your needs. They save you money by cutting the cost of these extraneous features. 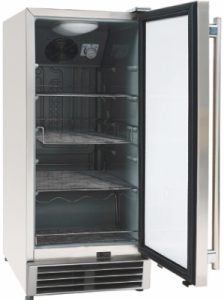 Here's another option from commercial/professional fridge-maker, Summit Appliance. Another cool feature of the Summit SPR627OS line is that some models have options for wood paneling and other door designs. Take a look here at Appliances Connection for some cool options. 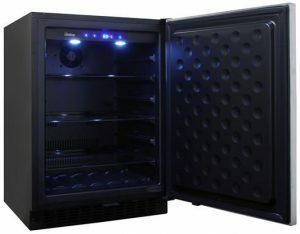 Here's another option from wine-cooler specialist, Vinotemp. The Vinotemp VT-OUTDOORREF is a 5.12 Cu. Ft. outdoor refrigerator that can be installed as either a built-in or freestanding unit thanks to the front exhaust vent. It has a sleek black cabinet body, with a recessed handle in the reversible stainless steel door so that it can be easily adaptable, and sit even with other cabinetry without protruding. This outdoor fridge is designed to work in temperatures from 44°F (7°C) to a scorching hot 106°F (41°C). The internal digital control panel allows for setting the temperature easily and simply from 36°F to 43°F, while its “Dynamic Cooling” feature keeps everything on the 3 adjustable shelves evenly cooled at the exact same conditions. Other features include an internal LED light, Silent and Sabbath modes, temperature and door alarms, a floor designed to keep bottles from jostling, leveling legs, and a security lock. Knowing your options goes a long way toward finding the best outdoor refrigerator for your budget and situation. It's often just a matter of finding the right combination of features and concessions. While I've listed a number of good options here that simply hold back on a few features, you might decide that there are a few good features that will be worth the extra expense. 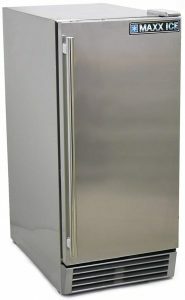 Is there a an outdoor refrigerator under $1,000 that you love and respect that is not represented here? 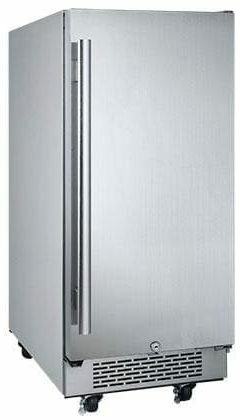 Or do you have a question about a fridge that you're considering purchasing? Put your questions or suggestions in the comments below, so we can all benefit from each other's knowledge. Happy Outdoor Living! Thanks for reading. I ALWAYS forget to read the manual carefully! I’m terrible for rushing into the set up and then wondering how I’m left over with a bunch of random nuts and bolts!